Anyone who starts planning a trip to Sikkim always goes for the obvious places like Gangtok, Tsomgo, Gurudongmar Lake, etc. A lot of people even include Ravangla, Namchi or Zuluk in their itinerary but almost no one ventures to the extreme west of this gorgeous state. Guess what, guys? There are several other places to visit in West Sikkim which are quaint and beautiful and will make you feel like you have been transported to a fairytale land. Pelling is one such beautiful offbeat destination in Sikkim which often gets missed due to these tourist spots but which is equally, if not more, enchanting as the other cities in this state. Also, this is the place from where you can leave on some really amazing trekking trails to make the most of your trip here. And if you love monasteries and palace ruins, then I am sure you would find this place worth the visit. 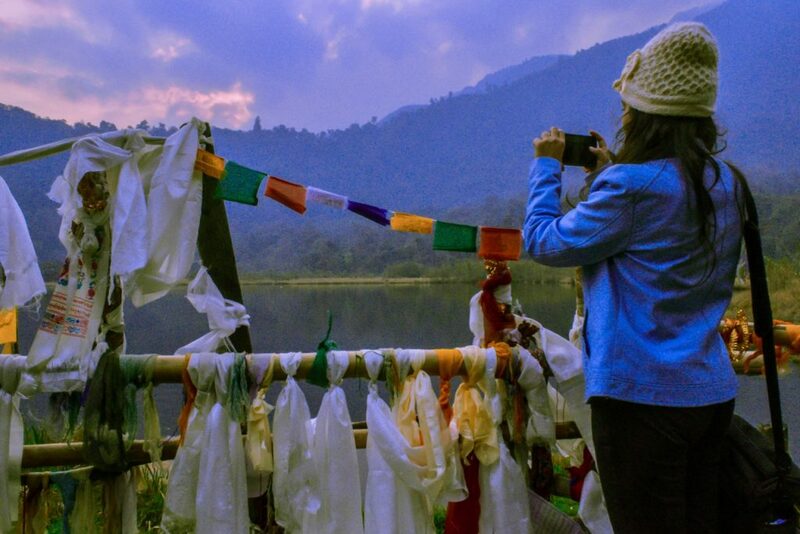 So, if you are looking for some quiet, tranquil time in Sikkim then Pelling is the place to head over to. Here, you will witness some gorgeous waterfalls, view of the Kanchenjunga mountains, bridges, and so on. It is a small, calm city so you won’t see a lot of hustle bustle which makes it a perfect place to relax and take in your surroundings. In this article, I will cover all the essential details that you would need in order to include this place in your itinerary. Well, as I mentioned above, Pelling is situated in the western Sikkim at an elevation of about 7,000 ft. It is a small hill town and is located at a distance of 131km from Gangtok and 10 km from Geyzing, one of the main towns in the Western Sikkim. This place lies just next to the Himalayas and the Kanchenjunga mountain ranges so you will get a clear, close view of these mountains. Since this is not as developed as other cities in Sikkim, you will find more alpine vegetation over here and numerous waterfalls in this area. 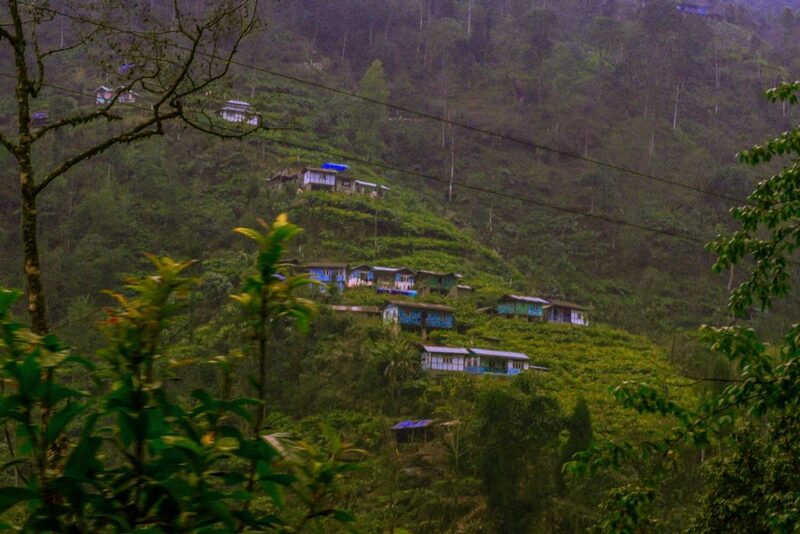 From Pelling, you can also reach other villages and towns in West Sikkim like Geyzing, Legship, Yuksom, and so on. Also, this is the starting point for most treks so, it is a must-visit place for all the adventure seekers out there. And you know the best part about this place? Since Pelling is located at a high altitude, it often receives snowfall in the winter months which gives an ethereal feel to this area. So, if you have always wanted to see pure untouched snow in the mountains, then Pelling is the place to go to. Unlike other major cities of Sikkim, it is slightly tricky to reach Pelling, especially if you don’t have your own vehicle. There aren’t any buses headed directly to Pelling so, you will need to first reach the Geyzing (district headquarters) before you travel further to this small hill town. As I said earlier, there isn’t any direct transport to Pelling if you don’t have your own car. So, the first point that you will need to reach is Geyzing. You can reach Geyzing via shared cabs, buses, or private taxis, but it mainly depends on where you are traveling from. It will take you about 5.5 – 6 hrs to reach Pelling from Siliguri/Bagdogra or Gangtok. Depending on your mode of transport, it can take you anywhere between 5-6 hours to reach Geyzing from Siliguri. From here, it will be another 30-40 minutes before you can get down at the Pelling town. You can get buses and shared jeeps back to Siliguri from Geyzing itself. Although there is no direct bus to Geyzing from Bagdogra, you will find buses from the Siliguri Bus Stand till 12.30 p.m. So, if you are planning to reach by bus then you will need to first reach the Siliguri Bus Stand from NJP or Bagdogra Airport. From Bagdogra Airport, you can either take a shared cab (300 INR), Private Taxi (700 – 800 INR), or a bus (30 INR). I personally took a bus which took me 45 minutes to reach the main Siliguri junction and was quite enjoyable as well. Another popular and budget-friendly option for reaching Geyzing from Siliguri/Bagdogra is to take a shared jeep/cab. You can find the shared taxis near the main junction which will cost you about 300 INR per person. Also, remember that the last direct shared taxi will leave before 2 p.m. so plan your journey accordingly. If you somehow don’t find a direct shared taxi to Geyzing, then you can go to Jorethang (150 INR) first and then get a shared taxi to Geyzing from there. You will find many prepaid taxis to Pelling from both NJP and Bagdogra but these will easily cost you 3,000 – 4,000 INR. So, if you are on a budget then I would advise you to avoid these taxis. You can instead opt for shared cabs or buses from the Siliguri bus stand. You might also opt to head to Pelling from Gangtok but you won’t find any bus option on this route. Again, you won’t find many direct shared cabs from Gangtok to Geyzing. In fact, there are only 3-4 taxis throughout the day which make this route at a fixed time. They usually depart at 7 a.m., 12 p.m., and 1 p.m. and cost about 300 INR per person. If you somehow manage to not avail a seat on one of these shared cabs, then don’t worry. You can take a shared cab till Ravangla instead and then another shared taxi to Geyzing. 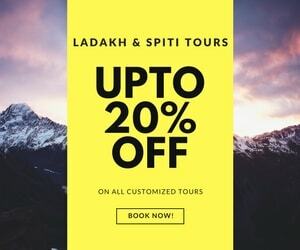 You will find many private taxi options from Gangtok to Pelling which will cost you about 3500 – 4000 INR and will take about 5 hours to reach. It would be certainly more comfortable than traveling in the shared cabs and will save you a lot of time too. Once you have reached Geyzing in a shared cab or a bus, you can further head to Pelling in a shared taxi or a private taxi. A shared taxi to this place will cost you about 50 INR per person but it would take some time to reach because they will wait for the taxi to get filled with passengers. 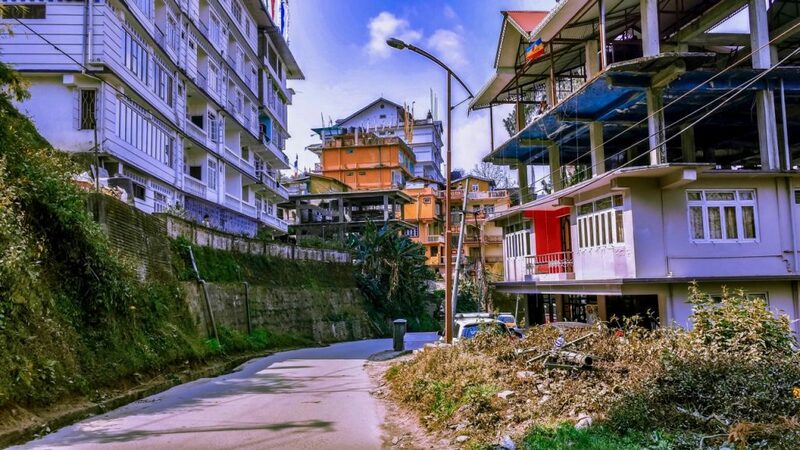 If you don’t want to waste too much time then you can always take a private taxi which will cost you 150 INR for dropping you off at your place of stay in Pelling. The best time to visit Pelling actually depends on what you are looking for. If you want to enjoy sightseeing around this small town and relax for a while then spring season is best from February to April. This is also the off-season so you are likely to find discounts on your accommodation here. If you want some respite from the summers then you can head here from May – July. However, if you want to witness some snow then you will have to plan your journey during the winter months of November and December. Note: If you are visiting due to snowfall, keep extra days at hand because the roads might get blocked due to excessive snowfall here. 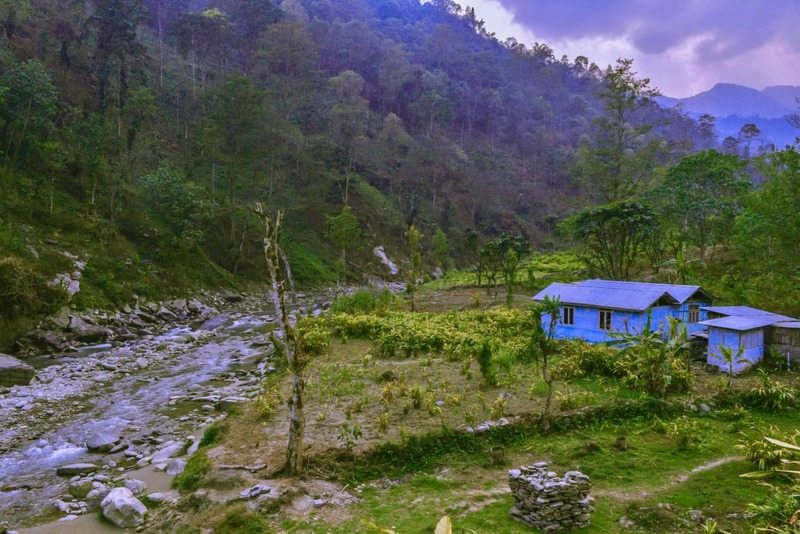 There are many hotels and homestays available in Pelling, many of which will cost you about 500 – 800 INR per night while providing an amazing view. Of course, you have some resorts here too which will cost you about 5,000 – 8,000 INR per night while giving you a luxurious feel during your travel. If you traveling during the off-season then you don’t need to pre-book your stay as there will be many options available. However, if you are traveling during the high summer season then it is better to book online or call a few homestays to reserve a place for yourself. While you won’t find as many eating spots as Gangtok here, there are a few decent places to dine at. Mostly, you will find here Chinese and Sikkimese dishes which will cost you about 200-300 INR per meal. Apart from that, you will also find some continental restaurants and a few cafes as well over here. Personally, I would suggest you stick to the local cuisine as it will be cheaper and more delicious. You could try other cuisines as well but be warned that they won’t taste the same as the other parts of the country. Although there are countless waterfalls, monasteries, etc. to visit near Pelling, there are a few that you absolutely cannot miss out on. Here are a few such places that you should include in your visit to this amazing land. One of the oldest and most important monasteries in the West Sikkim, Pemayangtse was founded in 1705 and is situated around 2 km from Pelling. This is a 3-story high-class monastery where you will find numerous sculptures, paintings, etc. of rainbows, angels, etc. This is the main monastery responsible for religious activities performed by the King of Sikkim and the top floor in this monastery, built out of wooden pieces, is considered to be a masterpiece. Another popular point of interest in Pelling is the Ruins of Rabdentse Palace which is basically a 20-30-minutes walk from the Pemayangtse monastery. 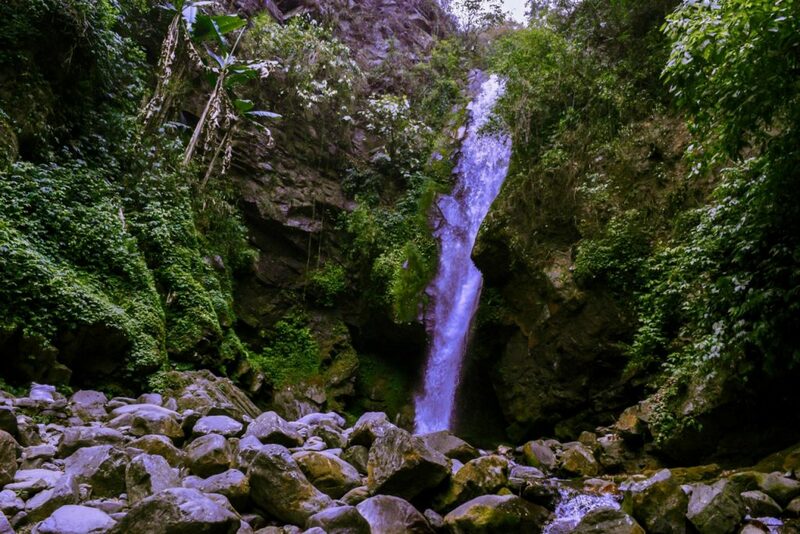 The walk is through a forest area where you will come across a few lakes and orchids as well. Once you climb the ruins, you will get a magnificent view of the valley and the Kanchenjunga ranges. This is undoubtedly one of the most beautiful waterfalls in the entire Sikkim and stays active throughout the year. It lies 28 km from Pelling and takes about 1 hour to reach via car. The waterfall is huge and slightly hidden from the main road so you don’t get immediately blown away by its magnificence. There are many small stalls here for eating too which makes this place an ideal picnic spot, where you can spend an hour or two quite easily. Another popular place to visit is the Rimbi river which is accessible via various plantations on the way. It is quite popular for fishing and has a strong water current during the monsoon time so, one should be careful while sitting on the river bank. Situated 27 km from Pelling, in the Uttarey direction, Singshore Bridge is another major place that all people should visit when spending time in Pelling. 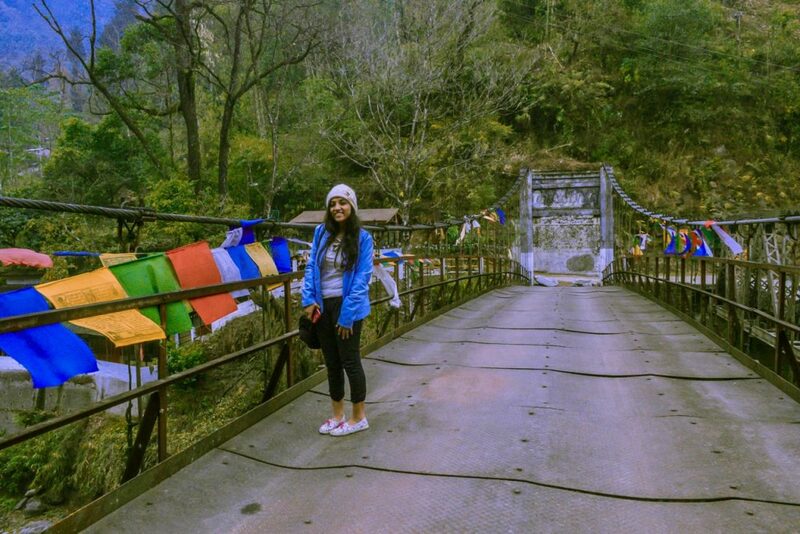 It is about 1-hour away from Pelling and is the second highest suspension bridge in Asia. When you walk to the middle of this bridge, you will witness and realize the true depth of the mountains and how amazing it truly is. 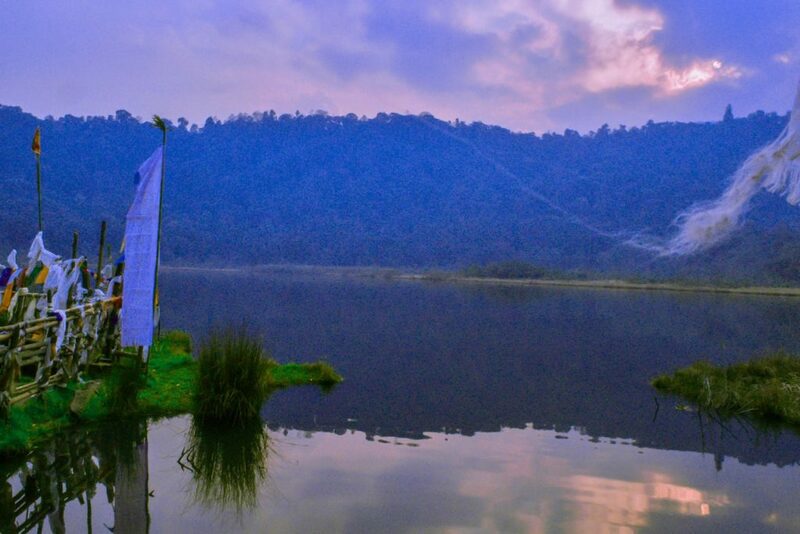 This is considered a sacred lake in Sikkim and is also known as the wish – fulfilling lake. 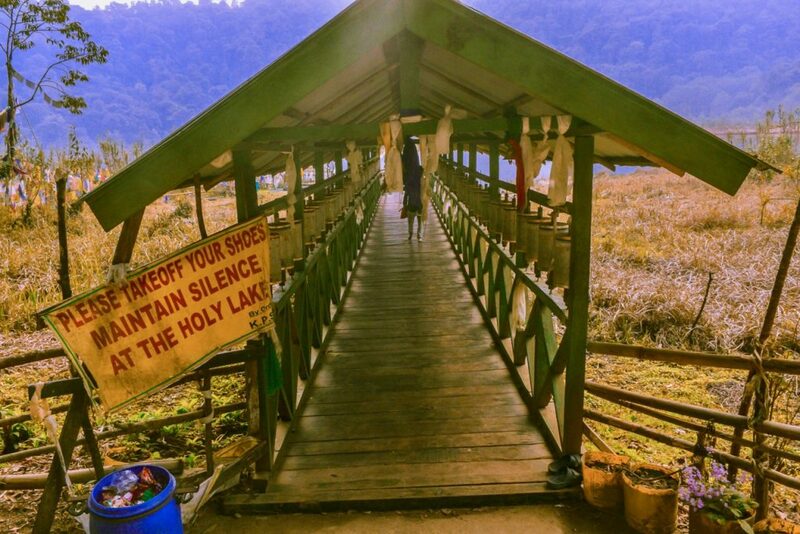 It is located near the Kanchenjunga waterfalls and is surrounded by a lovely forest, giving this lake a truly magical feel, especially during the evening. You will also find the pathway to this lake covered with prayer flags which gives a more colorful feel to this entire area. If you want to watch a magnificent sunset with an unobstructed view then you have to go to the Helipad area. This is the topmost point of Pelling and gives you a 360-degree view of the surrounding mountains and villages. The wind is always blowing hard at this point so, make sure you carry a warm jacket when walking to this place. Now, an important thing that you might be wondering is that how you can visit all these above-mentioned places in Pelling. Well, there are two options to go about it. The half-day shared taxi package usually consists of Kanchenjunga waterfalls, Khecheopari Lake, Orange Plantation, and Helipad Area. It starts about 6 – 7 a.m. in the morning and takes you around 2 p.m. to complete. Another option would be to visit the Rabdentse Ruins, Pemayangtse monastery, and the Singshore bridge in the half-day package. This type of packages is ideal for people who don’t have a huge budget or a lot of time on their hands. Another option would be to take a full-day package which will show you 4 places near Pelling in the morning and 4 places in the afternoon. However, it could become really hectic and be tiring for you so, be careful while choosing this option. 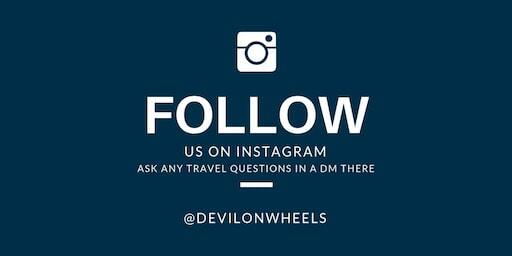 You could also opt for a customized package which will cost you about 1500 – 2000 INR in the off-season. This can include the places of your choice and will allow you sufficient time to enjoy in a particular place. Day 1: Reach Pelling by midday and check in to your hotel/homestay. Rest for a while and start for Kanchenjunga waterfalls, Khecheopari Lake, and the Rimbi river. Day 2: Get up early in the morning and walk to the Helipad area for a wide view of the mountains. Visit the Pemayangtse monastery and the Ruins of Rabdentse Palace and then walk around the Pelling town. Have lunch and rest for a while and then head to the Darap village and then to the Helipad area for the sunset view. Day 3: Get up early and head to the Singshore bridge. Spend 30 minutes or an hour here and then head to Geyzing to catch a shared taxi to Gangtok. There is only one ATM in Pelling which is of the State Bank of India so, it is advisable to carry some cash with you. You can withdraw some cash from Siliguri or Gangtok itself and carry smaller changes for a smooth transaction experience. As is the case with most mountain regions, most networks won’t come here except for Airtel and JIO. Although these two networks tend to be slightly sketchy from time to time too. So, don’t expect good mobile connectivity here, especially when you are traveling to the waterfalls and the other sightseeing places. If you wish to head to Gangtok from Pelling then you will need to pre-book a seat on the shared taxis, especially during the high season. This is because locals often book their seat months in advance so, you might not find a seat on the direct cab if you don’t pre-book it. Travel Tip: You should always keep a checklist of list of things to carry when traveling to offbeat places like Pelling and prepare accordingly. Pelling is not as touristy as other places of Sikkim which makes it the perfect getaway for solitude lovers. Also, if you love spending time in nature and wish to explore on your own for a while then Pelling if the ideal place for you to travel. If you like the article, please feel free to share it with any of your family or friends who are planning a trip to Pelling or West Sikkim. In the next article of the series, I am going to talk about Zuluk, another beautiful place from Sikkim. Now step out to experience the charm and beauty of this amazing place in the Himalayas 🙂 :). Rachita Saxena is from Delhi, India and has been travel blogging for the past three years. She loves to explore new places, both alone and with friends and then pens down her experiences to share with others. 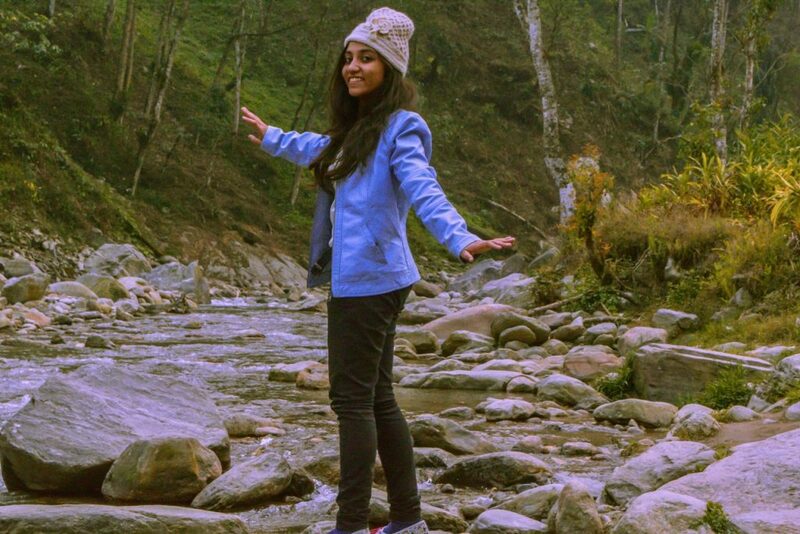 She run her own travel blog and Youtube Channel by the name of Nomllers with her best friend, Radhika Sharma. Their travel blog caters to budget travelers and aims to inspire others to leave their comfort zone and experience the unknown.